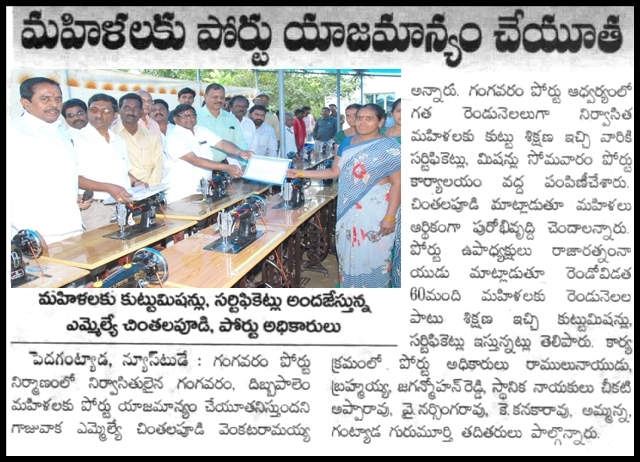 Certificates and sewing machines were distributed for 7th batch of women trained in Sewing Machine Operation under CSR programme of Gangavaram Port Limited. 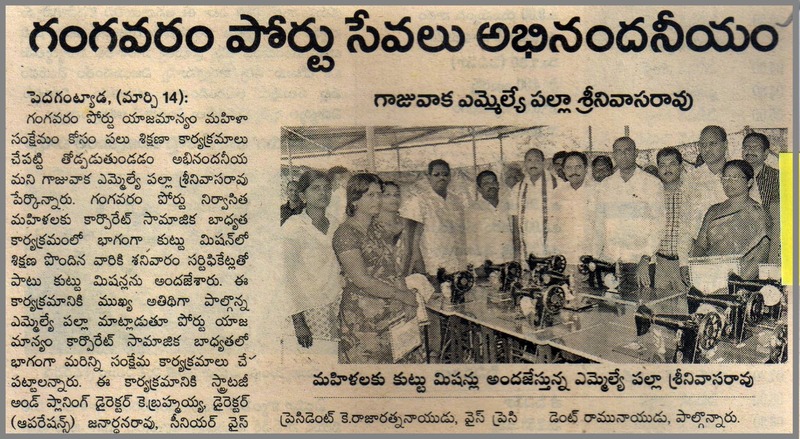 Sewing machine operation training was given to women under CSR program of Gangavaram Port Limited. 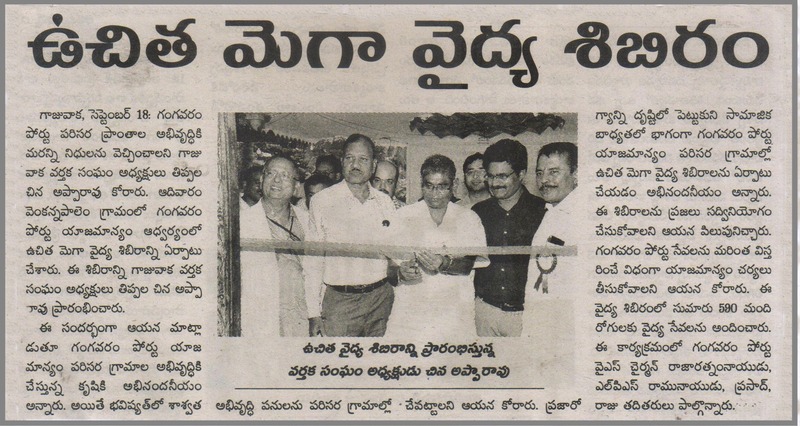 Gangavaram Port Limited contributes to repair works of school building and furniture to the school. 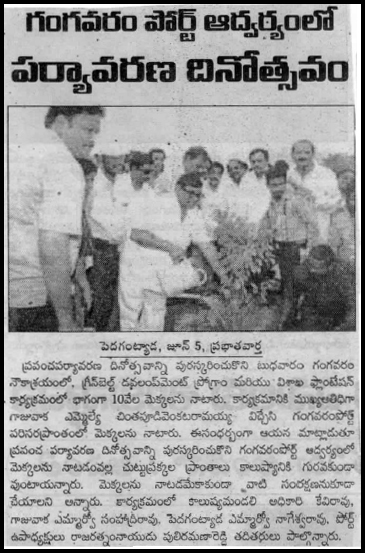 2500 plants were planted as part of "Vanam Manam" program at Gangavaram Port. 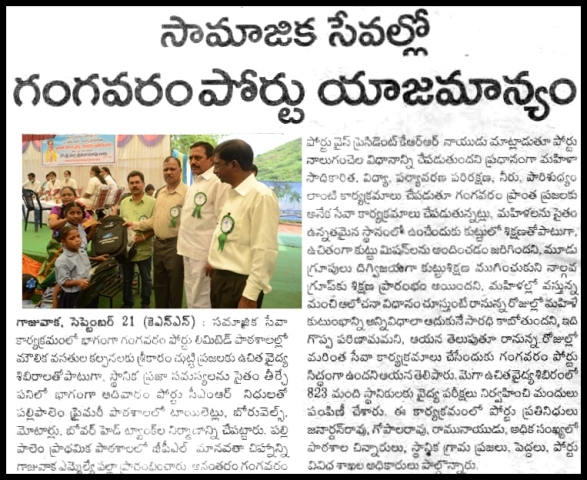 World Environment Day celebrated at Gangavaram port. As a CSR initiative, Drinking water was supplied to Rehabilitated villages during summer season by Gangavaram Port Limited. Gangavaram Port Limited contributed Rs 12.50 lacs towards construction of bio toilets and provision of drinking water facilities in Governament Girls schools in Visakhapatam district. 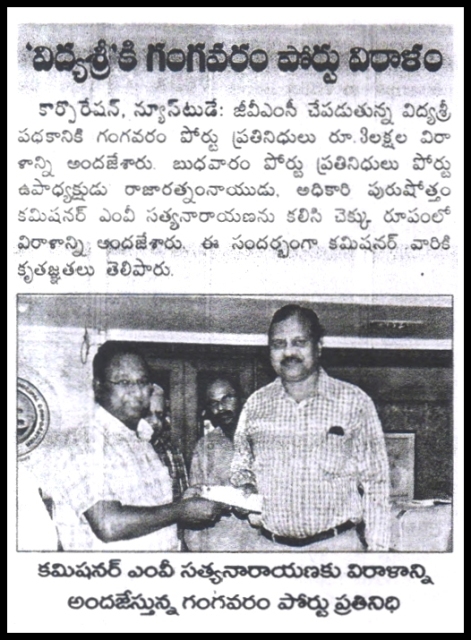 Mr L P S Ramu Naidu handedover cheque to Mr Praveen Kumar, District Collector , Viskhapatam. Gangavaram Port Limited conducted a Mega Medical Camp in Venkannapalem Village - Pedagantyada Mandal. 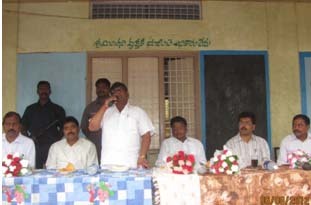 Sri Palla Srinivasa Rao, MLA, Gajuwaka inagurated the camp. 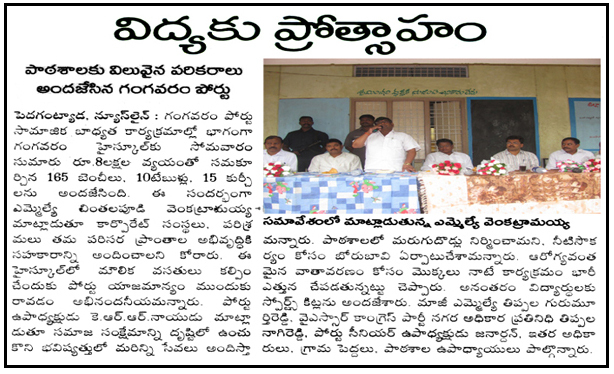 Gangavaram Port Limited conducted a Mega Medical Camp in H B Colony - Pedagantyada Mandal. 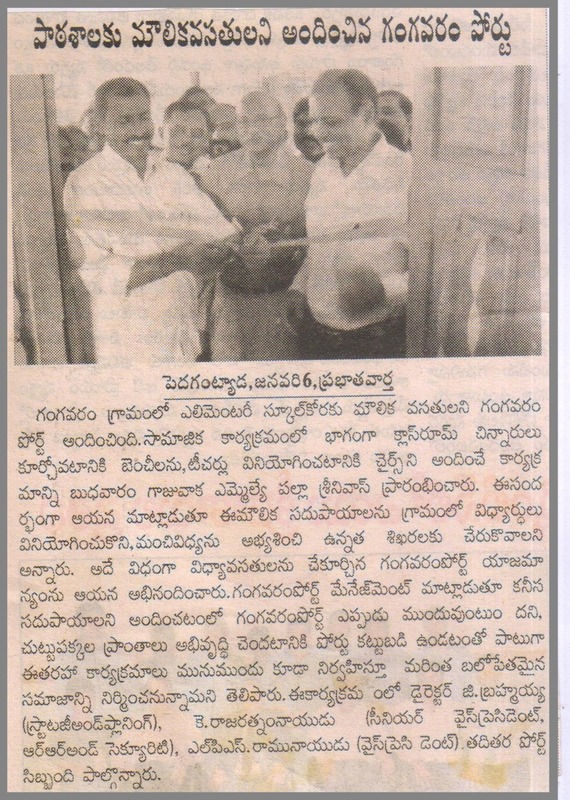 Sri Palla Srinivasa Rao, MLA, Gajuwaka inagurated the camp. 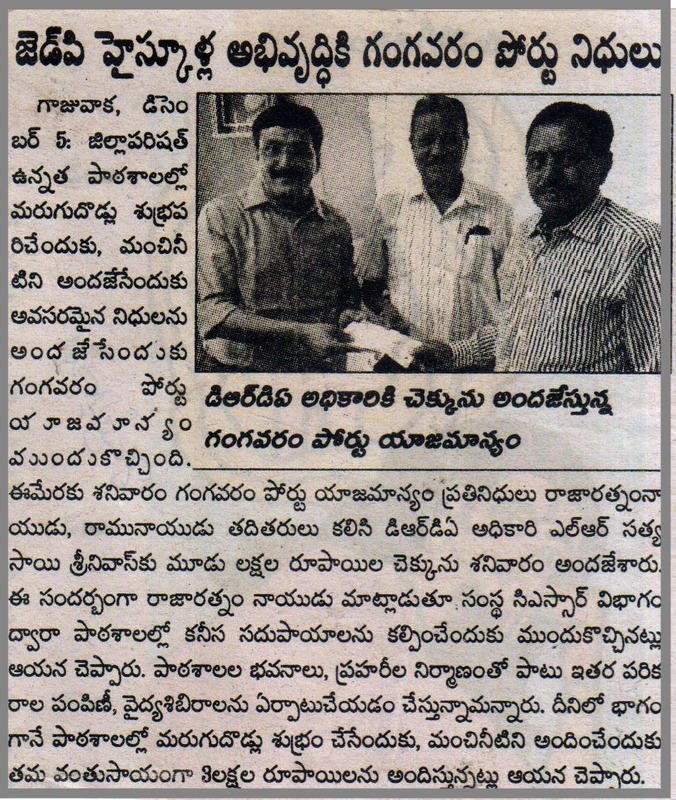 Gangavaram Port Limited donated Rs 15.40 lakhs for various development works at Gangavaram Village. Over 550 people have availed free medical services in Mega medical camp organiszed at Venkannapalem village by Gangavaram Port Limited. 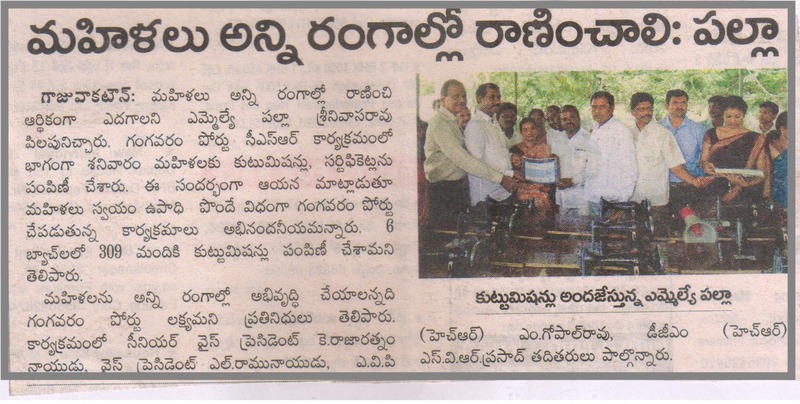 Scholorships were awarded by Gangavaram Port Limited to merit students in Z P High School, Gangavaram Village. 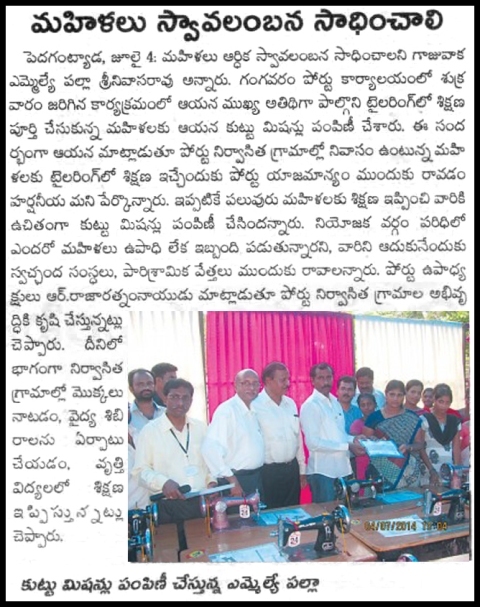 Scholorships were awarded by Gangavaram Port Limited to merit students in ZP High School, Gangavaram Village. 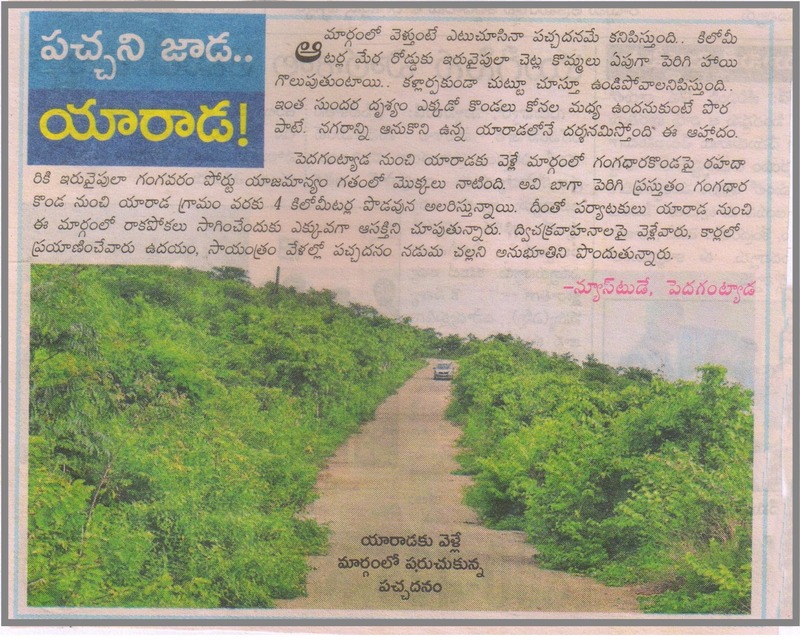 Green belt programme of Gangavaram port Limited turns iconic Yarada hill in Visakhapatnam into a lush green hillock. 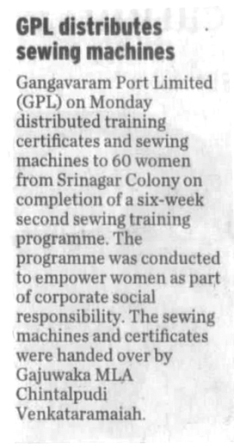 5th batch of women were trained for sewing maching operation under CSR programme of Gangavaram Port Limited. 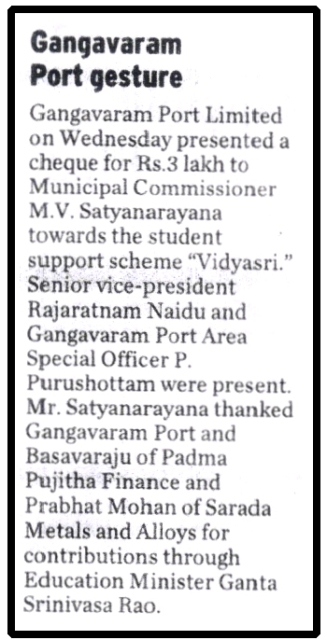 Gangavaram port has donated Rs. 5 lakhs (In addition to Rs. 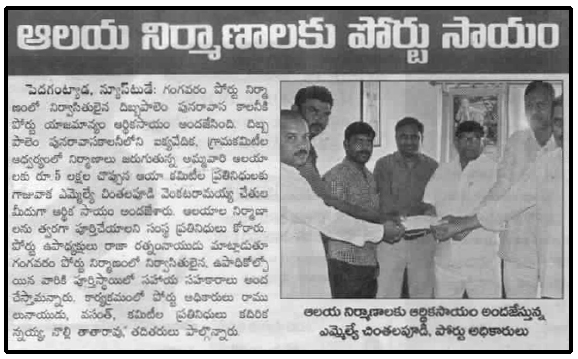 10 lakhs donated earleir) for renovation of Kalyana Mandapam in H B Colony area. 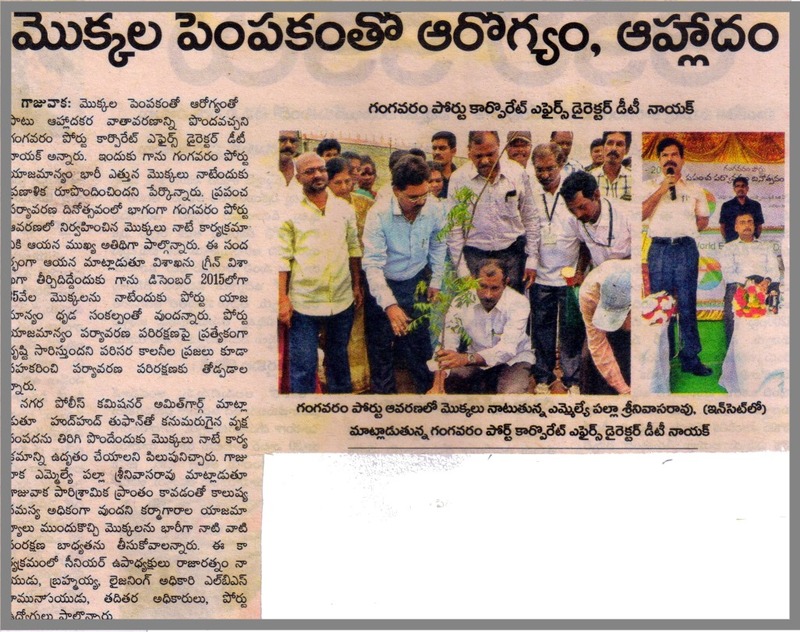 World Environement Day was celebrated with much fervour at Gangavaram Port Limited . 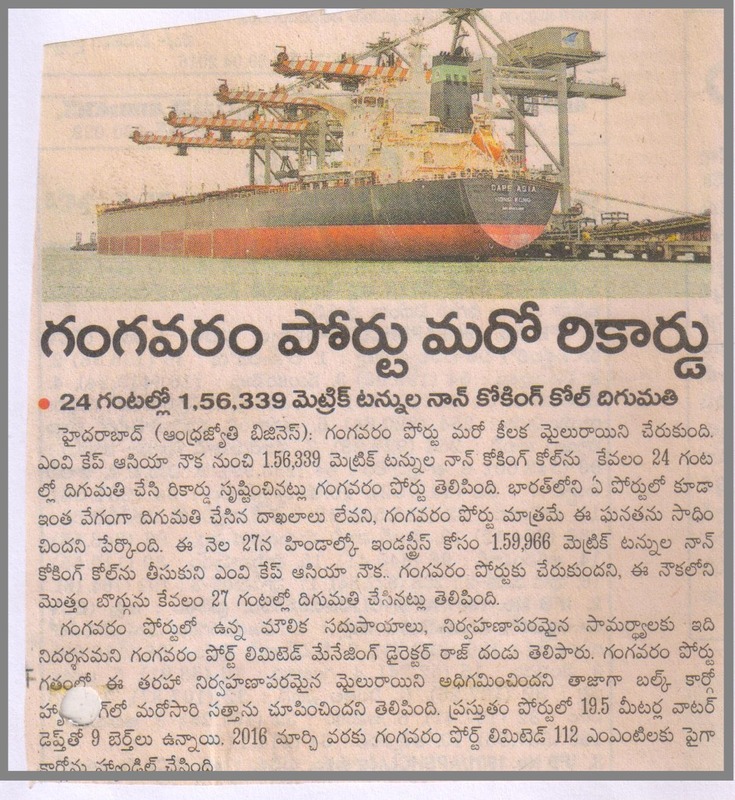 Gangavaram Port Limited creates record by dischrging 1,56,339 MT of coal in a span of 24 hours. Drinking water was supplied to Rehabilitated villages during summer season. 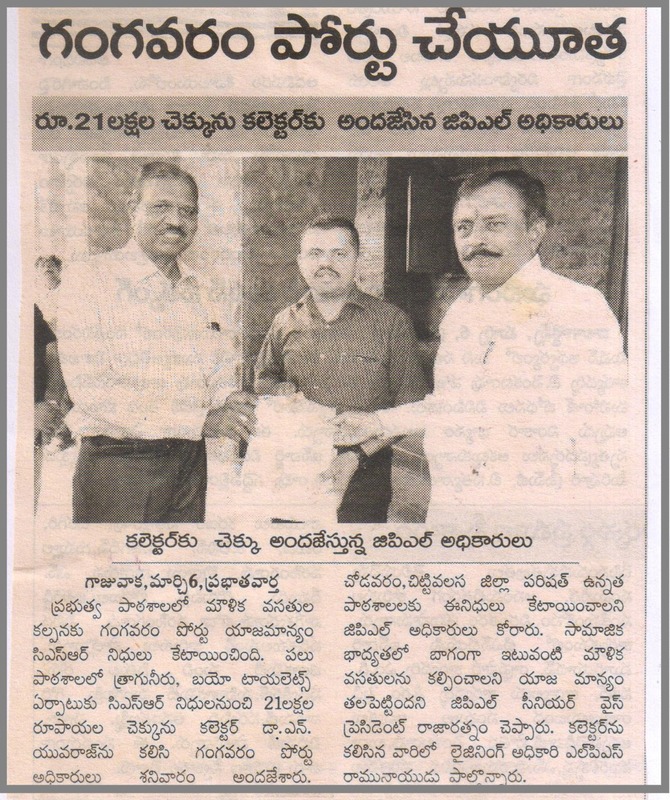 21 lakhs were donated by Gangavaram Port Limited for construction of bio toilets in Vishakhapatnam District. 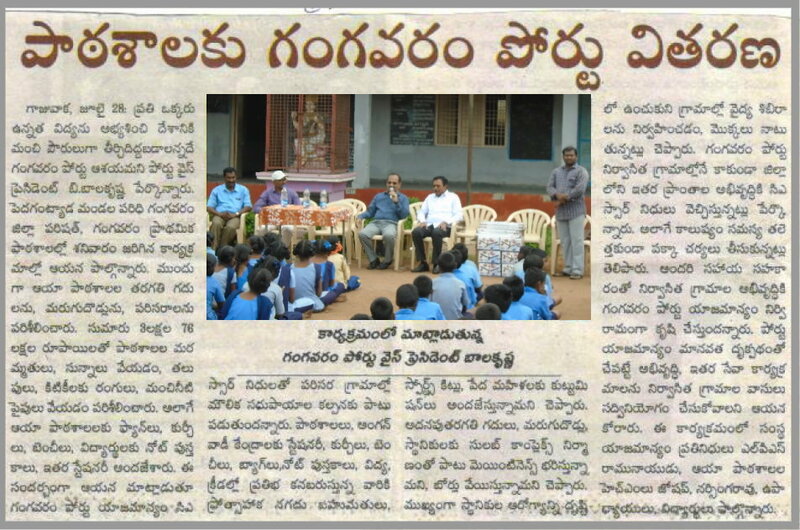 Gangavaram port Limited donated furniture for classrooms to Elementary School at Gangavaram village. 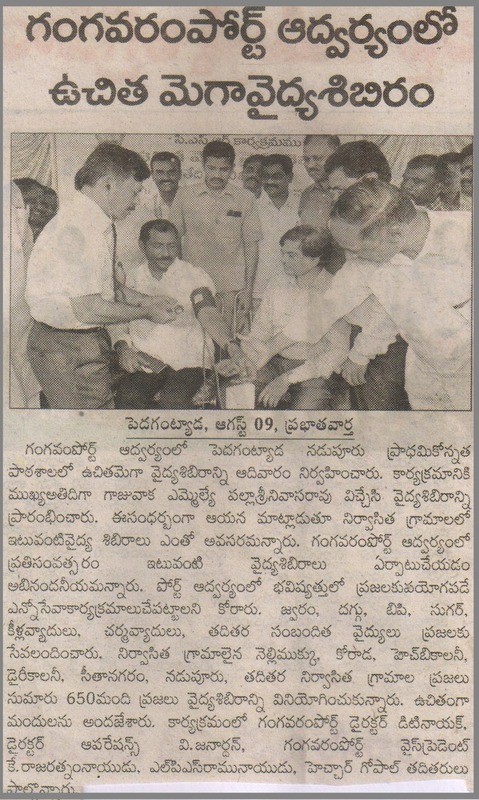 Gangavaram Port Limited conducted a Mega Medical Camp in Sri Nagar R H Colony. Sri Palla Srinivasa Rao, MLA, Gajuwaka inagurated the camp. Rs. 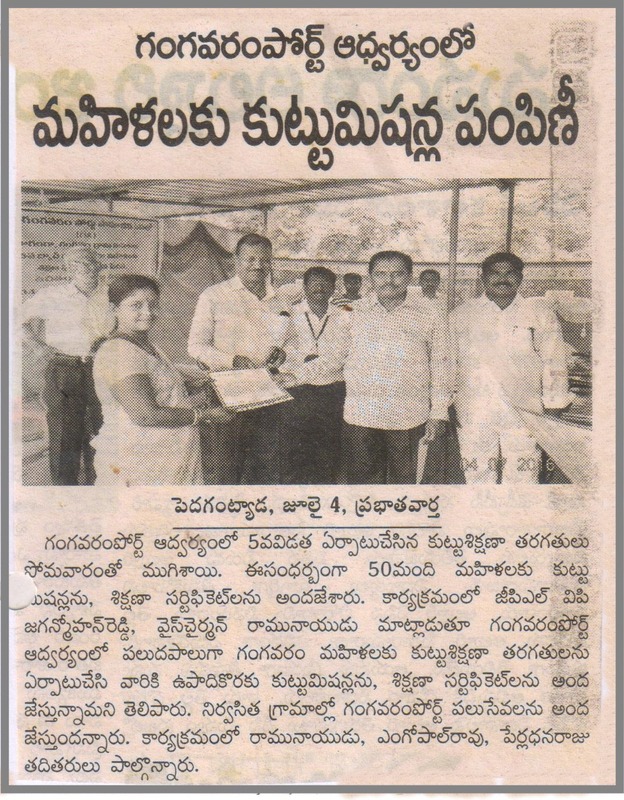 3 lakhs were donated by Gangavaram Port Limited under CSR programme to improve the facilities at Z P High School in Gangavaram Village. 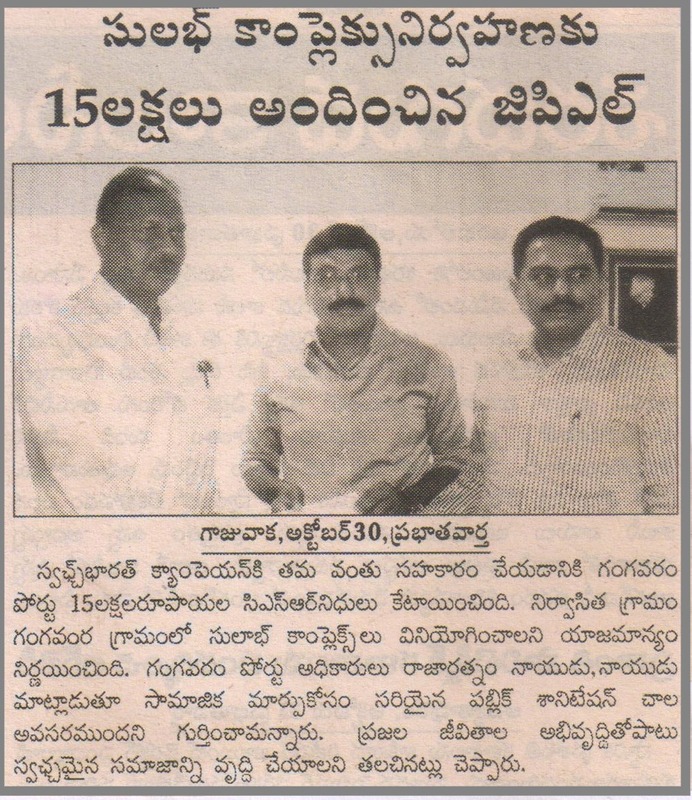 Gangavaram Port Limited donated Rs 15 lakhs for Swach Bharat programme. 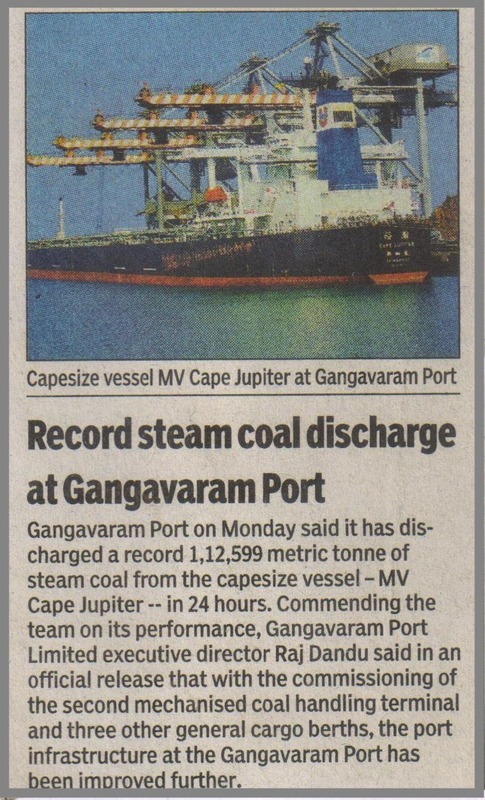 Gangavaram Port Limited creates record by dischrging 1,12,599 MT of coal in a span of 24 hours. 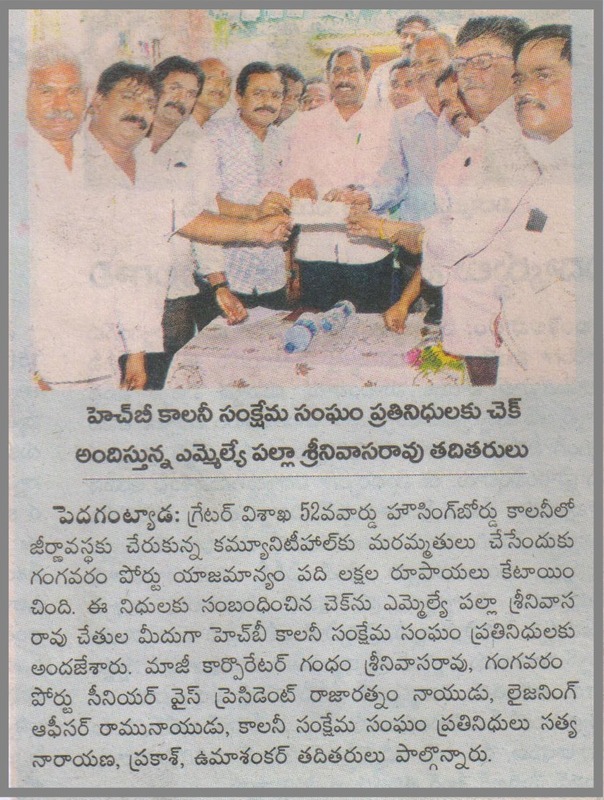 Gangavaram Port Limited donated Rs. 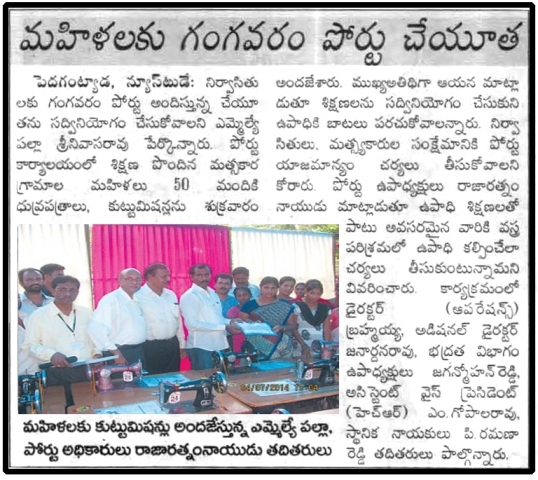 10 lakhs for developmental work at H B Colony - Pedagantyada. School bags and stationeary were distributed by Gangavaram Port Limited to students at Governament School in Gangavaram Village. 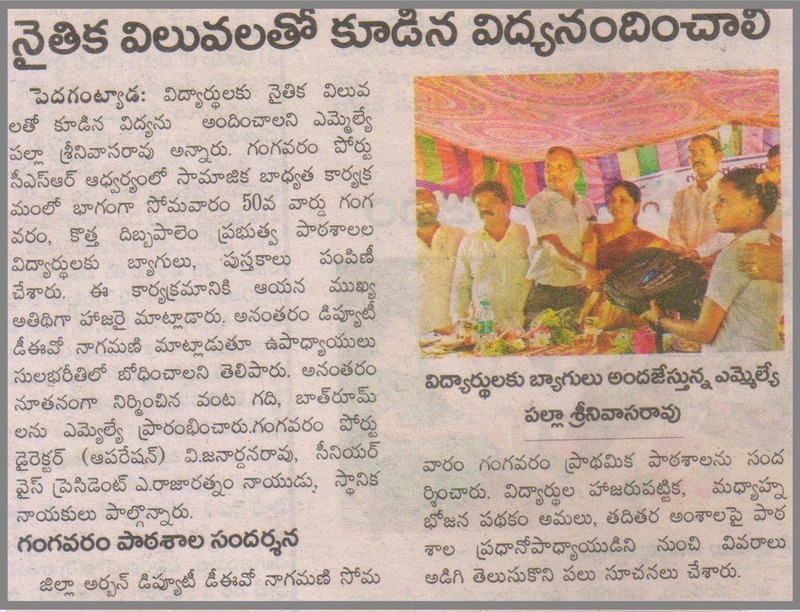 Mega Medical camp was organiszed by Gangavaram Port Limited in Nadupur Village. 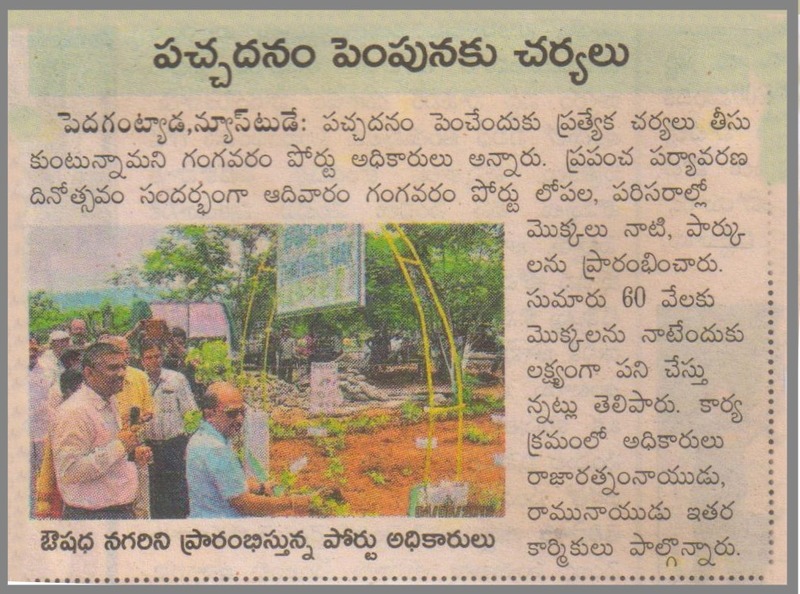 World Environment Day was celebrated at Gangavaram port. 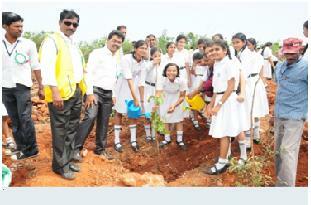 Large scale plantation work was taken up to mark the occassion. MLA, Gajuwaka appreciates Management of Gangavaram Port for thoughtful approach for women empowerment under its CSR programme. 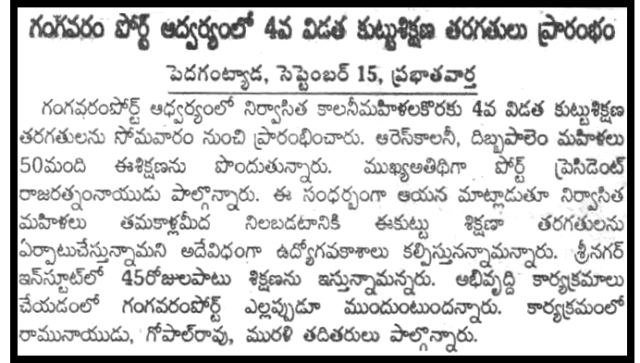 Step towards Swatch Bharat - Gangavaram port contributed 15 lakhs for maintainance of Sulabh complex in Gangavaram Area. 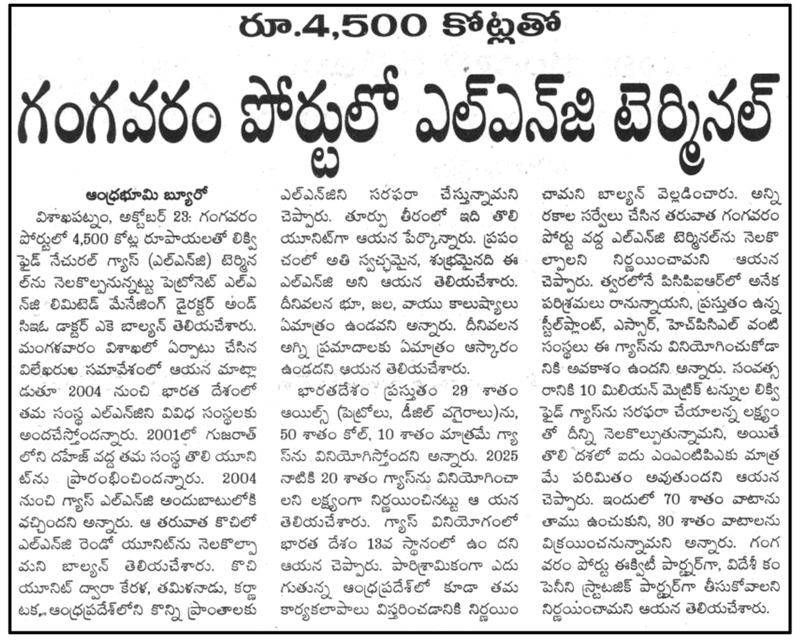 Development in villge with CSR funds from Gangavaram Port. Will work towards for the development of fishermen community. 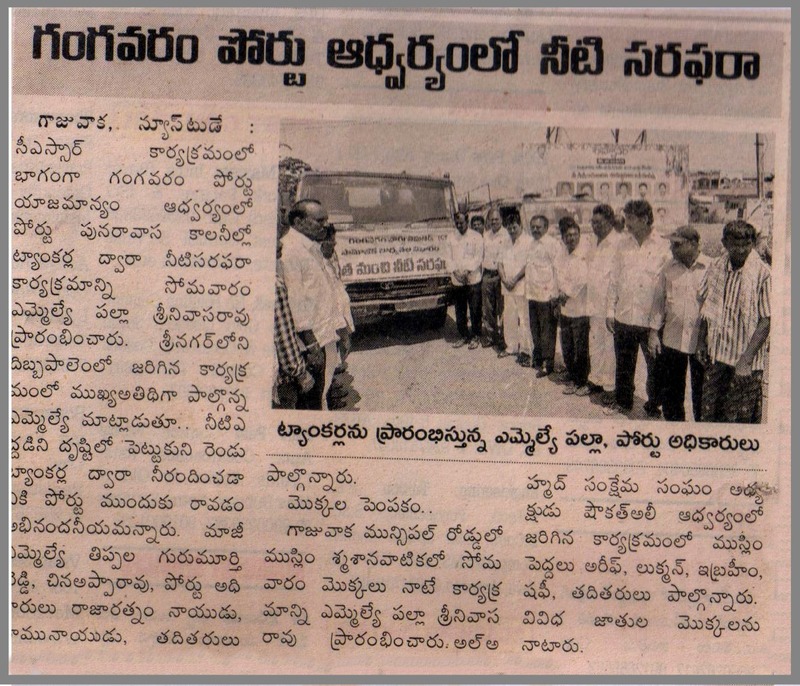 Management of Gangavaram Port in social responsibility activities. 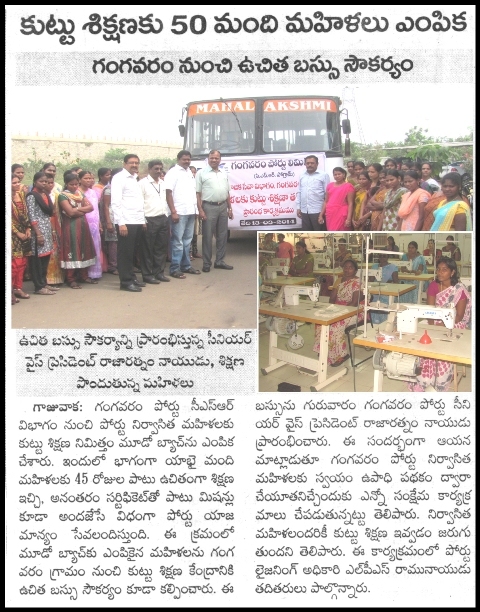 Gangavaram Port sponsored, Sewing machine Training for 4th batch of woman Gangavaram Port starts. 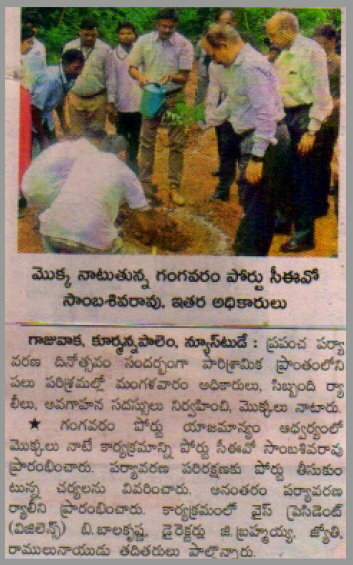 World Environment Day 2013- Green Belt Development Program started and a Fresh Phase of Green Visakha program Started at Gangavaram Port Limited. Visakhapatnam: Gangavaram Port Limited on Monday inaugurated the facilities created by it at Zilla Parishad High School at Gangavaram village. The facilities which included school infrastructure plus water and sanitation provisions were inaugurated by Gajuwaka MLA Ch. Venkataramaiah in the presence of former mayor P. Janardhana Rao and former MLA T. Gurumurthy Reddy. 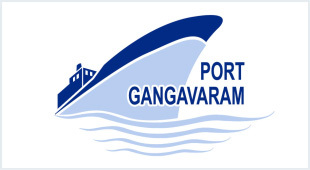 The initiative was a part of Gangavaram Port's corporate social responsibility program. As part of CSR, GPL said in a re-lease that it provided basic infrastructure and focused on creating water and sanitation facilities. GPL management provided 165 benches for 500 children to sit in their classrooms, 10 tables and 15 chairs for staff. Wash rooms were built for boys and girl. A bore-well was dug at the school to provide water. Sports kits were also presented to the students. The facilities provided by them would enable the students to study well in a conducive climate, said GPL Senior Vice-President K.R.R. Naidu. Visakhapatnam: The Gangavaram Port limited on Monday inaugurated a massive drive of planting 20,000 saplings near Yarada Hills as a part of the ‘Green Visakha’ project. GPL staff planted saplings of a variety of avenue plants as per the guidelines issued by the ‘Green Visakha’ programme committee. GPL has already undertaken land clearance, pitting and manure work and the entire programme will be completed by the end of August. District collector Lav Agarwal, commissioner of GVMC B Ramanjaneyulu, vice-chairman of VUDA Kona Sasidhar, MLA of Gajuwaka Ch Venkata Ramayya and other officials were also present on the occasion. Gangavaram Port Private Limited Vice-President Rajaratnam Naidu on Friday handed over a cheque for Rs.1.08 lakh to Greater Visakhapatnam Municipal Corporation for buying 50 bicycles as a part of its corporate social responsibility. 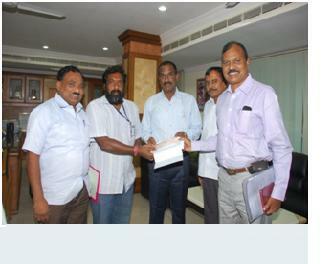 The cheque, towards promoting cycling introduced by Municipal Commissioner B. Ramanjaneyulu, was handed over to him. 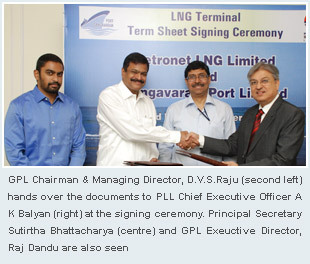 State-owned Petronet LNG Ltd (PLL) on Wednesday signed a deal with Gangavaram Port Ltd (GPL) to built a land-based liquefied natural gas (LNG) terminal in the country at Visakhapatnam- based private port. The terminal which is the third in the country for Petronet is likely to become operational in next 6 months. The other two are an operational 10 MMTPA terminal at Dahej in Gujarat and five MMTPA terminal at kochi in Kerala. Petronet LNG Managing director A.K.Balyan said, “The construction work on the terminal is expected to start with a year and it shell be ready to commence operations by 2016”. The Gangavaram LNG terminal will help meet the growing energy demand of Andhra Pradesh and will also cater to the increasing gas requirements of Eastern and central part on India. In a statement, the Chief minister’s office said that the terminal will contribute around 2000Crore in Value Added Tax (VAT) every year to the state and provide employment to 1000 people in four years. Mr.D.V.S.Raju, the Chairman of Gangavaram Port Ltd, said “This will be the only LNG terminal in the entire East Cost of India”. 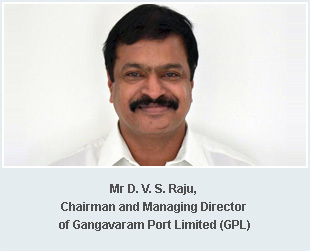 At 51, Mr D. V. S. Raju, Chairman and Managing Director of Gangavaram Port Limited (GPL), is in a bit of a hurry. He has tasted success in port operations and would, therefore, like to go the whole hog in his present capacity. Gangavaram port, the private facility promoted by him on the Andhra Pradesh coast, received its first vessel in August 2008. In 2010-11, the port, complete with five berths. Handled more than 14 million tonnes of cargo, of which, coal alone was approximately 10 million tonnes (mt). Mr Raju wants to add to the port's capacity by constructing, at the earliest, four new berths - one fully mechanized coal berth and three other multi-purpose berths. “I would like see the new berths commissioned by October 2013, to achieve a port capacity of about 44/45 mt,” he remarks. The funding, he says, will be a combination of internal generation, loans from banks and external commercial borrowing, roughly in the ratio of one-third each. There is no immediate proposal for a public issue. This might come as a surprise to many, particularly those who are judging Mr Raju from his past, would love to see him more as a venture capitalist than anything else. , Mr Raju was promoter Managing Director of Satyam Computer services ltd, but got out of it at the right time. He floated Visual Soft Technologies Ltd, but again sold it. He holds a Master's in computer engineering from Ohio University, USA. In India, winning a contract is one thing and starting work is another. There were so many hurdles which had to be overcome before the actual work could start in 2005. So much so that Dubai Port World, that had agreed to partner with Mr Raju in the project, withdrew in the face of resistance from various quarters. The proposal from a Malaysian firm for partnership too didn't make much headway. The change of government in the state threw up myriad challenges which were handled deftly. Finally, a foreign private equity fund stepped in and held 30 per cent of the equity and the Andhra Pradesh Government another 11 per cent, with the majority 59 per cent being held by Mr Raju. Also, a five-year operation-and-management contract has been signed with Portia Management Services, the port consultancy arm of the Liverpool Port Authority and Mersey Docks & Harbour Company, UK. More importantly, he is looking into new opportunities in the port sector, both within the country and outside. Outside, it could be Australia, Europe, Southeast Asia and even Africa. “But in Africa, the regulatory framework is not properly structured; also, it is difficult to compete with China which has an overwhelming presence there,” he says. Another issue which is causing concern is the proposal to bring private ports also under a regulator. “A regulator is welcome for security and safety-related issues but certainly not for fixing the tariffs,” he says, emphasising, “let the market determine the tariffs; after all, efficient services must command efficient price.” Also, the kind of regulatory mechanism ideal for the power sector catering to millions of ordinary consumers cannot be suitable for the port sector, whose customer profile is very different. Referring to the mushrooming of ports on the eastern seaboard, he only hopes that the promoters of these projects are aware of the challenges in port operations. The hinterland of container traffic can be vast, as the boxes to and from Punjab pass through JN port, but this need not be true about dry bulk cargo, whose onland haulage across long distance may not be cost-efficient. The east coast ports are generally dry bulk cargo handling ports. “But then, if the economy grows at the projected eight to nine per cent, there will be more steel production and power generation and the slice of pie will become proportionately larger and hopefully there will be room for everyone to grow. I'm an optimist,” he adds. The Hindu IN GROWTH MODE: A view of the Gangavaram port in Visakhapatnam. Gangavaram Port Limited (GPL), which owns an all-weather deep water satellite port under Public Private Partnership programme, has commenced construction work in full gear to achieve a cargo handling capacity of 40.95 million tonnes. A spokesperson for GPL told The Hindu that the construction work for expansion was going on in full swing and it was likely to take 24 months to complete the expansion project. 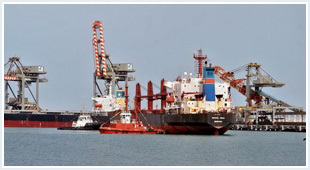 At present, Gangavaram Port has a capacity to handle 16.54 million tonnes per annum. After its formal inauguration in 2009, it has finalised the first phase of expansion. At present, it has five deep draft fully mechanised berths. The expansion project includes one coal and three multipurpose berths and additional stacking area. The management at the time of public hearing held last year had stated that it would have most modern mechanised cargo handling system, additional storage and evacuation facilities to meet future requirements. In lieu of 1,800 acres of land, the government will have equity of 11 per cent. Visakhapatnam Port, owned by the Visakhapatnam Port Trust, is on massive mechanisation and modernisation mode and is getting ready to handle 110 million tonnes by 2014-15. Visakhapatnam Port is one of the premier ports among 13 major ports. It handled 67.41 million tonnes during 2011-12 as against previous year's 68.04 million tonnes, the second highest after Kandla. The cargo handling fell down marginally over the previous year due to dislocation caused by ongoing expansion work and fall in iron ore exports. Gangavaram Port, which has the advantage of being a Greenfield port, handled a throughput of 14 million tonnes during 2011-12 compared with previous year's 13.93 million tonnes. It handled 9.5 million tonnes of coal, 2.14 million tonnes of iron ore and 1.91 million tonnes of other cargo during 2011-12. In the previous year, it handled 9.52 million tonnes of coal, 2.58 million tonnes of iron ore and 1.83 million tonnes of other cargo. Asked why the cargo remained almost the same, the spokesperson pointed out: “The basic reason for the overall cargo numbers remaining the same is the unprecedented decline in iron ore exports, a concern faced by all ports across the country. Resolving a long pending impasse over payment of property tax, Gangavaram Port has agreed to pay 35 per cent of the tax in cash and the remaining 65 per cent for development of areas in the vicinity of the port. The Gangavaram Port management on Friday handed over a cheque for Rs.86.1 lakh, being 35 per cent of the tax payable since 2009, to Municipal Commissioner B. Ramanjaneyulu. The government has declared the port industrial area local authority (IALC) and a notified area resulting in its not paying property tax which drew severe criticism from the Opposition. The criticism became sharper with the steep hike in property tax by the corporation and citing its lack of resources for a rollback. Municipal Commissioner B. Ramanjaneyulu took up the issue and the State-level Notified Areas Committee met thrice in the last six months to thrash out the issue. The final decision was arrived at a meeting in Hyderabad on Wednesday. Mr. Ramanjaneyulu said the corporation provided houses under JNNURM by footing 30 per cent of the cost to those displaced by giving land to the setting up of the port. Besides infrastructure was created and the port was being supplied water, he said. He said in spite of being declared IALC and coming under the Notified Areas Committee, Gangavaram port had responded positively to the GVMC's request to pay the property tax. 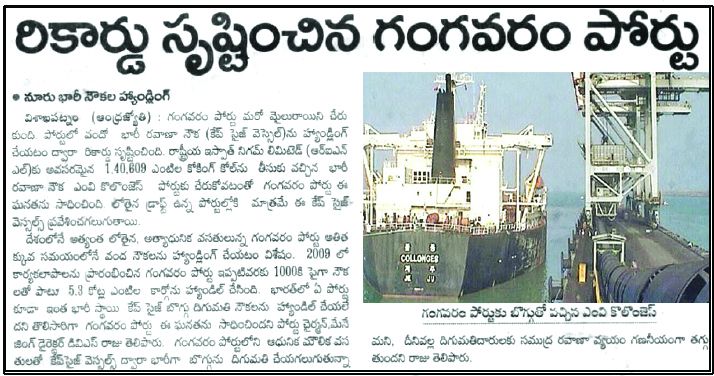 As the port expanded, the scope for GVMC improving its revenues would improve. Gangavaram Port Trust Vice-Chairman Rajaratnam Naidu said following a request by the commissioner the port would foot 50 per cent of the cost for central lighting from Karnavanipalem junction to Gangavaram port main gate and the roads leading to the port. It will also contribute 50 cycles to GVMC cycle club. Additional Commissioner S. Krishna Murthy, Chief Engineer B. Jayarami Reddy, Deputy Commissioner (Revenue) M. Viswanadham and Notified Area Committee special officer Purushottam participated.